UNA's web presence is the public face of our university. It communicates our image and our identity. It markets UNA in a way that affects our ability to recruit and retain the best students. Digital communication is a critical piece in our ability to fulfill the university mission. The Digital Communications team is focused on maintaining a creative digital strategy that simplifies access, navigation and discovery while promoting consistent high-quality design through the use of leading-edge web technologies. We provide Web Lion training and resources that encourage departmental excellence that remains consistent with the UNA brand. 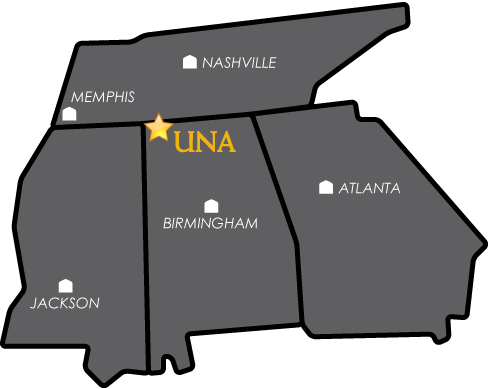 A cohesive web presence and a strong visual tie to the UNA brand adds strength to our message and reassures visitors. More important — it enables our Web Lions to focus on delivering content that is timely, relevant and compelling. A shared brand unifies, simplifies and defines us.